"Sucker" is a song by American pop rock group Jonas Brothers. The song, released on March 1, 2019, through Republic Records, is the group's first single together in six years. The group co-wrote the song with its producers Ryan Tedder and Frank Dukes, with additional writing with Louis Bell. The Jonas Brothers appeared on The Late Late Show with James Corden each night from March 4 to March 7 to promote the track. It has reached number one in Australia, Canada, Latvia, Mexico, New Zealand, Singapore, Slovakia and the United States. The group blacked out their social media prior to announcing the release on February 28. Us Weekly had also revealed the title of the song before the announcement. Nick Jonas stated that "We've kept this a secret now for almost seven, eight months." In the United States, "Sucker" debuted at number one on the Billboard Hot 100 and the US Hot Digital Songs chart, with 88,000 copies sold in its first week. It was the thirty-fourth song to debut atop the Billboard Hot 100. "Sucker" became the Jonas Brothers' first number-one song and the first number one by a boy band on the chart since 2003's "Bump, Bump, Bump" by B2K featuring P. Diddy. It became the band's first entry on the chart since 2013's "Pom Poms" and their first top 10 since 2008's "Tonight". The Jonas Brothers also became the second group in a lead role in history to have a song debut at number one after Aerosmith's "I Don't Want to Miss a Thing" and the first group in this century to achieve this. In its April 20, 2019 issue, "Sucker" became the Jonas' first number one on Dance/Mix Show Airplay, surging to the top spot within four weeks. The music video was directed by Anthony Mandler and premiered showcasing the brothers with each of their significant others: Kevin's wife, Danielle Jonas; Nick's wife, Priyanka Chopra Jonas; and Joe's fiancée, Sophie Turner. It was filmed in Hertfordshire at Hatfield House the home of the Marquess of Salisbury, where Queen Elizabeth I grew up and featured corgis, which are the favorite breed of Queen Elizabeth II. Their outfits were designed by Prabal Gurung, from his debut menswear line. Priyanka had 10 hairstyles for the music video created by Ken O'Rourke, with only seven making the final cut. On March 7, 2019, the Jonas Brothers performed the song for the first time on The Late Late Show with James Corden. ^ @RyanTedder (February 28, 2019). "To write for something actually very specific...& secretive enough it needed an NDA😯- over the last 3-4 months we've written a ton & ive been blown away by their talent, professionalism & SPEED..super proud of this 1st song -let's go!🙌🏻 (2 Of 2)" (Tweet) – via Twitter. ^ a b Mercuri, Monica (February 28, 2019). "The Jonas Brothers Reunite And Announce New Single 'Sucker'". Forbes. Retrieved March 1, 2019. ^ Heller, Corinne (February 28, 2019). "Jonas Brothers Reunite for First Song 5 Years After Split: Watch Them Perform 'Sucker'". E! Online. Retrieved March 1, 2019. ^ Gottlieb, Steven (March 4, 2019). "WATCH IT: Jonas Brothers "Sucker" (Anthony Mandler, dir.)". VideoStatic. Retrieved April 5, 2019. ^ Bonner, Mehera (March 1, 2019). "Priyanka Chopra and Sophie Turner Are in the New Jonas Brothers Video and Fans Have LOST IT". Cosmopolitan. Retrieved March 1, 2019. ^ Hill, Erin (March 1, 2019). "The Jonas Brothers' Music Video Has a Major Royal Connection — and It's Not Just the Corgi Cameo!". People. Retrieved March 1, 2019. ^ Bose, Sumona (March 12, 2019). "The Sucker Video Features Fashion And Designers From All Over The World And We Love It". The Hauterfly. Retrieved April 3, 2019. ^ "Usher x Zaytoven - Say What U Want (Audio)". October 11, 2018 – via YouTube. ^ Acevedo, Angelica (March 8, 2019). "Jonas Brothers Rock the House in 'Sucker' TV Debut on 'Late Late Show': Watch". Billboard. Retrieved April 3, 2019. ^ "Sucker / Jonas Brothers". Tidal. Retrieved March 1, 2019. ^ "Billboard Argentina Hot 100 – Semana del 31 de Marzo". Billboard Argentina (in Spanish). Retrieved March 28, 2019. ^ "Australian-charts.com – Jonas Brothers – Sucker". ARIA Top 50 Singles. Retrieved March 16, 2019. ^ "Austriancharts.at – Jonas Brothers – Sucker" (in German). Ö3 Austria Top 40. Retrieved March 14, 2019. ^ "Ultratop.be – Jonas Brothers – Sucker" (in Dutch). Ultratop 50. Retrieved April 12, 2019. ^ "Ultratop.be – Jonas Brothers – Sucker" (in French). Ultratop 50. Retrieved April 19, 2019. ^ "Jonas Brothers Chart History (Canadian Hot 100)". Billboard. Retrieved March 12, 2019. ^ "Jonas Brothers Chart History (Canada AC)". Billboard. Retrieved April 2, 2019. ^ "Jonas Brothers Chart History (Canada CHR/Top 40)". Billboard. Retrieved April 2, 2019. ^ "Jonas Brothers Chart History (Canada Hot AC)". Billboard. Retrieved April 2, 2019. ^ "Top 100 Colombia – Semana 13 del 2019– Del 22/03/2019 al 28/03/2019" (in Spanish). National-Report. Archived from the original on March 29, 2019. Retrieved March 29, 2019. ^ "ČNS IFPI" (in Czech). Hitparáda – Digital Top 100 Oficiální. IFPI Czech Republic. Note: Change the chart to CZ – SINGLES DIGITAL – TOP 100 and insert 201911 into search. Retrieved March 19, 2019. ^ "Track Top-40 Uge 12, 2019". Hitlisten. Retrieved April 3, 2019. ^ "Top 100 Ecuador – Semana 13 del 2019 – Del 22/01/2019 al 28/01/2019" (in Spanish). National-Report. Archived from the original on March 29, 2019. Retrieved March 29, 2019. ^ "Jonas Brothers: Sucker" (in Finnish). Musiikkituottajat – IFPI Finland. Retrieved March 24, 2019. ^ "Le Top de la semaine : Top Singles (téléchargement + streaming) – SNEP (Week 10, 2019)" (in French). Syndicat National de l'Édition Phonographique. Retrieved March 12, 2019. ^ "Offiziellecharts.de – Jonas Brothers – Sucker". GfK Entertainment Charts. Retrieved March 15, 2019. ^ "Archívum – Slágerlisták – MAHASZ" (in Hungarian). Single (track) Top 40 lista. Magyar Hanglemezkiadók Szövetsége. Retrieved March 14, 2019. ^ "Archívum – Slágerlisták – MAHASZ" (in Hungarian). Stream Top 40 slágerlista. Magyar Hanglemezkiadók Szövetsége. Retrieved March 14, 2019. ^ "IRMA – Irish Charts". Irish Recorded Music Association. Retrieved March 9, 2019. ^ "Year 2019, Week 14". Media Forest Israel. Retrieved 7 April 2019. ^ "Top Singoli – Classifica settimanale WK 10" (in Italian). Federazione Industria Musicale Italiana. Retrieved March 9, 2019. ^ "Jonas Brothers Chart History (Japan Hot 100)". Billboard. ^ "Billboard Japan Hot Overseas" (in Japanese). Billboard Japan. March 25, 2019. Retrieved March 20, 2019. ^ "Latvijas Top 40". Latvijas Radio. March 19, 2019. Archived from the original on March 19, 2019. Retrieved March 22, 2019. ^ "Top 20 Most Streamed International & Domestic Singles In Malaysia" (PDF). Recording Industry Association of Malaysia. Recording Industry Association of Malaysia. Retrieved March 14, 2019. ^ "Nederlandse Top 40 – week 16, 2019" (in Dutch). Dutch Top 40 Retrieved April 20, 2019. ^ "Dutchcharts.nl – Jonas Brothers – Sucker" (in Dutch). Single Top 100. Retrieved April 5, 2019. ^ "NZ Top 40 Singles Chart". Recorded Music NZ. March 18, 2019. Retrieved March 15, 2019. ^ "VG-lista – Topp 20 Single uke 12, 2019". VG-lista. Retrieved March 23, 2019. ^ "Portuguesecharts.com – Jonas Brothers – Sucker". AFP Top 100 Singles. Retrieved March 21, 2019. ^ "Airplay 100 – 14 aprilie 2019" (in Romanian). Kiss FM. April 14, 2019. Retrieved April 15, 2019. ^ "Official Scottish Singles Sales Chart Top 100". Official Charts Company. Retrieved March 30, 2019. ^ "Singapore Top 30 Digital Streaming Chart Week 11" (PDF). Recording Industry Association (Singapore). Archived from the original (PDF) on March 25, 2019. ^ "ČNS IFPI" (in Slovak). Hitparáda – Radio Top 100 Oficiálna. IFPI Czech Republic. Note: insert 201913 into search. Retrieved April 2, 2019. ^ "ČNS IFPI" (in Slovak). Hitparáda – Singles Digital Top 100 Oficiálna. IFPI Czech Republic. Note: Select SINGLES DIGITAL - TOP 100 and insert 201911 into search. Retrieved March 19, 2019. ^ "SloTop50 – Slovenian official singles chart". SloTop50. Retrieved 15 April 2019. ^ "Top 100 Canciones: Semana 10". Productores de Música de España. Retrieved March 13, 2019. ^ "Veckolista Singlar, vecka 16". Sverigetopplistan. Retrieved April 19, 2019. ^ "Swisscharts.com – Jonas Brothers – Sucker". Swiss Singles Chart. Retrieved March 11, 2019. ^ "Official Singles Chart Top 100". Official Charts Company. Retrieved March 30, 2019. ^ "Jonas Brothers Chart History (Hot 100)". Billboard. Retrieved March 12, 2019. ^ "Jonas Brothers Chart History (Adult Contemporary)". Billboard. Retrieved March 26, 2019. ^ "Jonas Brothers Chart History (Adult Pop Songs)". Billboard. Retrieved April 16, 2019. ^ "Jonas Brothers Chart History (Dance Club Songs)". Billboard. Retrieved April 19, 2019. ^ "Jonas Brothers Chart History (Pop Songs)". Billboard. Retrieved April 16, 2019. ^ "Jonas Brothers Chart History (Dance Mix/Show Airplay)". Billboard. Retrieved April 2, 2019. ^ "ARIA Australian Top 50 Singles". Australian Recording Industry Association. March 25, 2019. Retrieved March 23, 2019. ^ "Canadian single certifications – Jonas Brothers – Sucker". Music Canada. Retrieved April 9, 2019. 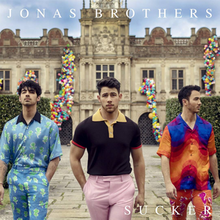 ^ "New Zealand single certifications – Jonas Brothers – Sucker". Recorded Music NZ. Retrieved April 12, 2019. This page was last edited on 19 April 2019, at 23:42 (UTC).